In 2017, 98,000 people attended 750 events held at the McNamara Alumni Center including conferences, wedding receptions, meetings and other special events. 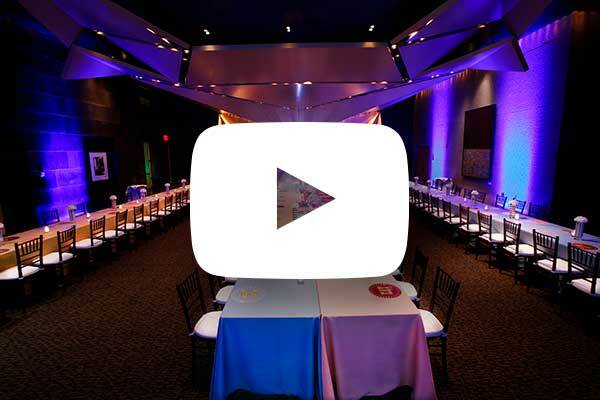 This University of Minnesota office building and special event venue is located on the East Bank of the University of Minnesota Minneapolis campus, across from Williams Arena and TCF Bank Stadium. An adjacent 500-car ramp is connected by tunnel to the Alumni Center. The ramp entrance is on University Ave. Parking is $3.00 per hour with a daily maximum of $12.00. Evening events at the Alumni Center may qualify for event rates of $8.00-$10.00 per car. Once inside the parking ramp, take the East elevator to tunnel B or street level. The Alumni Center is the copper building adjacent to the ramp. 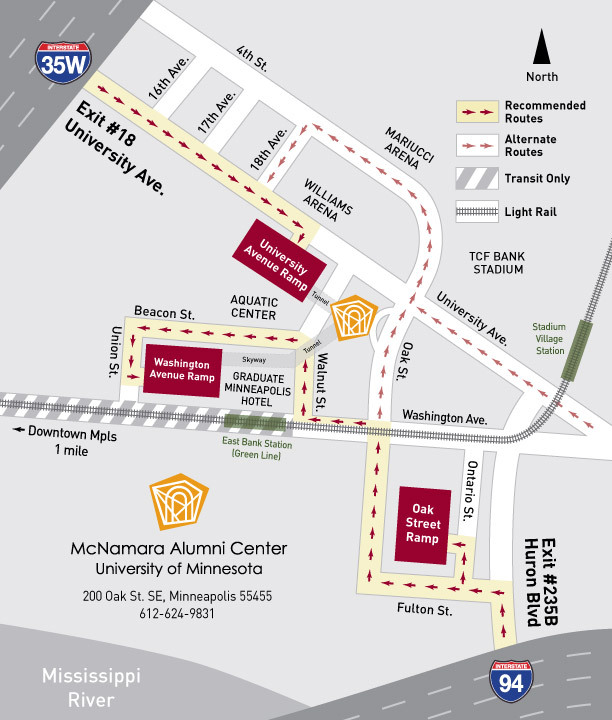 This University of Minnesota office building and event venue is located on the East Bank of the University of Minnesota Minneapolis campus, across from Williams Arena and TCF Bank Stadium. An adjacent 500-car ramp is connected by tunnel to the Alumni Center. The ramp entrance is on University Ave. Parking is $3.00 per hour with a daily maximum of $12.00. Evening events at the Alumni Center may qualify for event rates of $8.00-$10.00 per car (cash only). The Alumni Center is the copper building adjacent to the ramp. 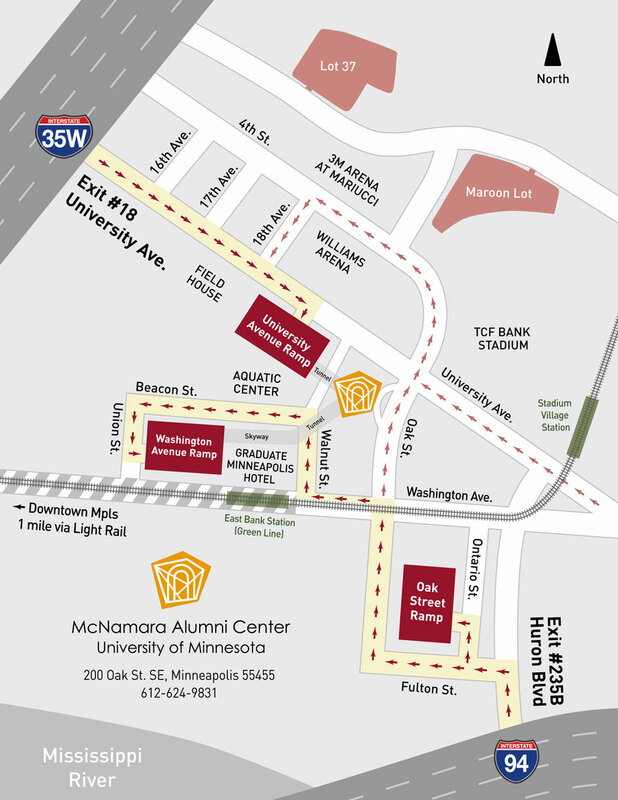 Follow Oak St past the Alumni Center (on the left) and cross over University Ave.
A 1300-car ramp is located 1 block southwest of the Alumni Center and attached via tunnel to the Graduate Minneapolis hotel and McNamara Alumni Center. Parking is $3.00 per hour with a daily maximum of $12.00. Please consult with the Graduate Minneapolis hotel directly for more information about overnight parking with in and out privileges. Drive 2 blocks and turn left onto Union St. The Washington Ave Ramp entrance is on the left. The Oak St. entrance accommodates drop-offs with a 20 minute limit. Two 15-minute meters are at the Oak St. entrance. Metered street parking is available along Oak Street — Accepts credit cards. Enforced M-Sat until 8pm. Free on Sundays. Two handicapped parking spaces are available at the Center's entrance on Oak Street. 2 blocks south of the alumni center is the Oak St Ramp. This ramp has a $6.00 daily rate on weekends beginning Friday at 5:00pm through Sunday. Metro Transit Buses 2, 113, 114, 115, 465, and 475 stop just outside McNamara Alumni Center at Oak Street and Washington Avenue. Stop ID: 41248 (heading South) and 40278 (heading North). A Nice Ride station is located right outside McNamara on Walnut St.